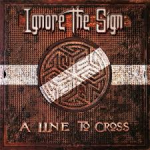 Share the post "Album review: IGNORE THE SIGN – A Line To Cross"
Ignore The Sign are a new band formed around the trio of vocalist/keys/guitarist Ossy Pfeiffer, guitarist/vocalist Anca Graterol (Rosy Vista) and guitarist Steve Mann (MSG/Lionheart). The are joined by bass player Lars Lehmann (Uli Jon Roth), percussionist Momme Boe and drummer Kristof Hinz, who appeared on last year’s comeback album from Eloy. Opening with the grand statement ‘Saviours Of Rock’, Ignore The Sign set out their musical stall, namely big riffs and melodies, reminiscent of Def Leppard and an ear for a decent tune. The title track has been released as a lead song of the album, however I’d have ‘Saviours Of Rock’ out next as it is so darn catchy. Def Leppard again come to mind on the opening guitar on ‘No Way Home’, another enjoyable piece of melodic hard rock. The ballad ‘Brother’ is another well crafted song, not unlike Boulevard, whilst ‘Behind The Wall’ is a slow building atmospheric song, co-written by Steve Mann and his fifteen year old son Jason, impressive work by both. ‘The Story Isn’t Over’ taps into a 70′s hard rock sound driven along by some tasty Hammond playing, which nods towards the sound of Uriah Heep. ’Days Of Thunder’ is one of the heaviest songs on the album, nothing special but again it has a very catchy melody. Anca Graterol fair rips of the studio linings with her passionate singing on ‘Can’t Find The Door’. Again the Hammond and guitars move this song along nicely. This entry was posted in ALBUM REVIEWS, ALBUM REVIEWS (Mobile), All Posts and tagged A Line To Cross, album, classic rock, debut, Def Leppard, Ignore The Sign, Lionheart, melodic, review, rock, SPV. Bookmark the permalink.